Are Indiana debt relief programs legit? Reviews all across the internet illustrate how legitimate these programs truly are. Just in Indianapolis alone, more than 2.8 million Indiana residents have used Golden Financial’s debt relief programs to become debt free, going back since 2004. So, the results speak for themselves! 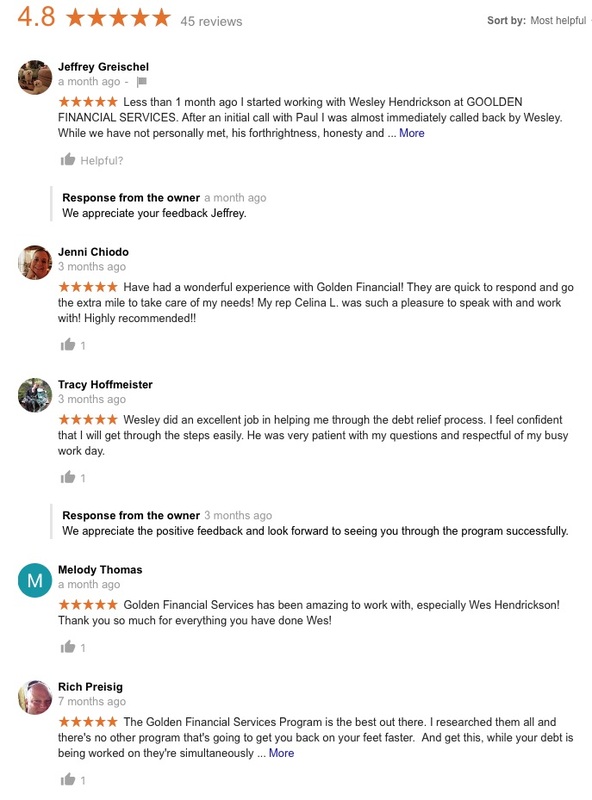 TrustedCompanyReviews.com just reviewed the best debt consolidation companies in the nation and rated Golden Financial Services #1 (click to check it out). So, yes you’ve landed in the right spot if you’re buried in debt and need immediate relief. Here at Golden Financial Services, our debt counselors are all certified by the International Association of Professional Debt Arbitrators (IAPDA), and Golden Financial Services is A+ rated by the Better Business Bureau. You can get a free consultation right now and learn about Indiana debt relief programs for free. If you’re eligible, you can enroll with ease. To start, just call (317) 981-7823 or Toll-Free (866) 376-9846. Plans include a money back guarantee and credit repair. You can become debt free in 24-48 months (average), depending on what’s a comfortable monthly payment for you. Recently lost your job or have had your income reduced? Hardship programs can knock your monthly payment down by near 45%. No Up-Front Fees or High Cost to Get Started! First off, you can always rebuild your credit score. It will not be reported that you joined a debt relief program unless you decide to use consumer credit counseling. Indiana residents are also provided free credit repair on the debt validation program. The credit repair would be for any debts that are proven to be invalid because once invalidated the collection agency can no longer legally report the debt to each credit reporting agency. Additionally, you are provided an installment type loan for the purpose of establishing new positive payment history. By showing a positive payment history, that’s how you can improve your credit score. The programs offered through Golden Financial Services offer you an immediate reduction in monthly payments, no out of pocket or up-front fee. Even with debt settlement, your creditors won’t get paid each month, but you will have one low monthly payment. You can choose to become debt free in 12 months, 24 months, 36 months or even 48 months if you’re in need of the lowest possible monthly payment. What if the plan doesn’t work and I get ripped off? With Golden Financial’s plans, no fees are earned until each debt gets resolved. With validation services, a money back guarantee is even provided, ensuring you only pay if results are achieved. You will be referred to a law firm to settle your debt if you receive a summons while on the program, ensuring the debt gets resolved before it ever goes to court. You would get a refund of any fees paid into the plan towards a particular debt so that these funds can be used to settle that debt immediately, keeping you far away from any courthouse! Most people have already had their credit negatively affected before joining a debt relief program. Just by having maxed out credit cards your credit score is getting negatively affected. To qualify for debt settlement, Indiana residents must be delinquent on monthly payments. By falling behind on payments, you’ll get late marks and collection accounts on your credit report, which will lower your credit score. One by one throughout your debt settlement plan, each debt will get reduced, settled and paid off. As the debts are paid off one by one, your debt to income ratio improves (DTI). This is one factor that could help your credit improve, but there’s no guarantee of this. The only way to guarantee your credit score improves is to establish new positive payment history and ensure you are not late on any future payments. Unfortunately, debt settlement programs in Indiana don’t include credit repair or a money-back guarantee. However, this next option does! Millions of dollars in delinquent credit card debt ends up getting forgiven and in many cases proven to be invalid and legally uncollectible every single year. A legally uncollectible debt is one that you don’t have to pay, and it can no longer legally remain on your credit report. It’s hard to imagine, but often debt collection companies can’t prove a debt is valid. This is not because you didn’t spend the money, it’s due to their inability to provide proof that the debt is valid, by providing complete records and proof that what they claim a person owes is 100% accurate. Debt validation is your legal right to dispute a debt. The debt validation program disputes each debt for you, forcing each debt collection company to prove the debt is valid. Most of the time, the debt collection companies quickly agree to stop collection on the debt and in many cases even agree to remove the debt from all credit reports. Due to this phenomenon, debt validation can be your simplest and most effective route to dealing with credit card debt. 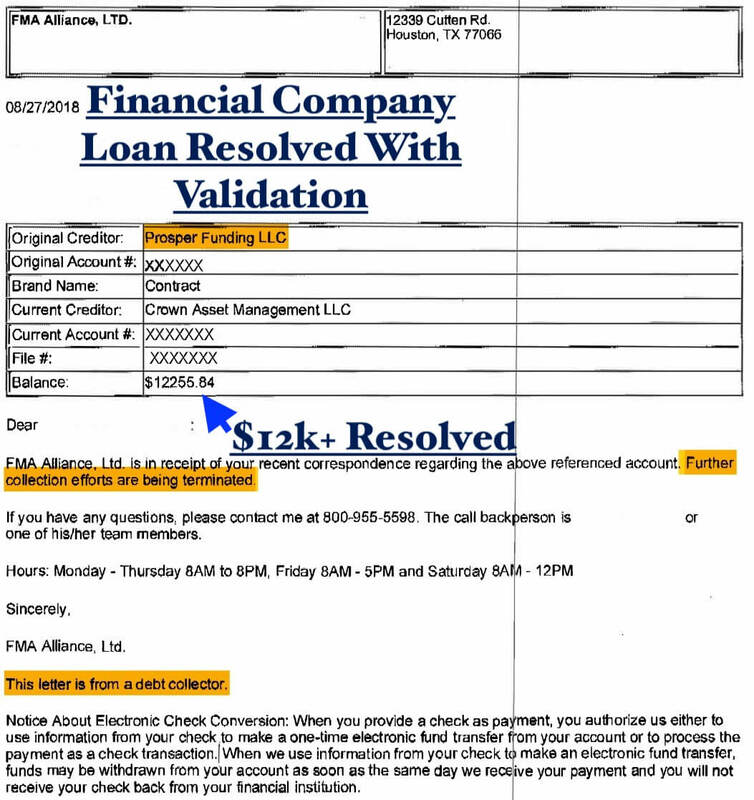 This client used the validation program to resolve this credit card account. The alleged balance was $18,600. Once disputed with validation the collection agency quickly turned around agreeing to stop collection on the debt and remove it from the consumer’s credit report immediately. The collection agency could not prove that the account was valid. Collection agencies often don’t have all of the documentation that a validation program requests and that federal law require them to maintain in their office. For example, debt validation requests that the debt collection company provide the original agreement that the consumer signed when initially applying for the credit card. If the collection agency can’t produce this document, the debt becomes legally uncollectible (invalid). Perhaps, the collection agency couldn’t prove the amount was valid that they claimed the consumer owed. Often, collection agencies add in unauthorized fees to the balance that you never agreed to, where now they could not prove the debt is valid even if they attempted to. Or perhaps the collection agency violated the Fair Debt Collection Practices Act, Credit Card Act or Fair Credit Billing Act, and in this case, they would instead release the consumer of the debt. Aside from the federal laws we mentioned above, there’s also Indiana state laws. For example, the Statute of Limitations on Debt in Indiana is six years. Often this law is violated by collection companies trying to collect on expired credit card bills. Relief is quickly provided to consumers once approved for debt validation if their creditors have violated the Statute of Limitations because each debt gets disputed right away. Following the dispute, creditors must cease all collection activity until they prove that the debt hasn’t expired past the Statute of Limitations. Once the account is disputed, collection companies need to provide a response where they detail their knowledge on when the Statute of Limitations for that particular account is, ensuring Indiana residents get their consumer rights protected. If they can’t provide accurate and complete records, here’s what happens to the debt. Validation was used to prove this account to be invalid, where the consumer no longer is legally required to pay it. A balance of $12,255.84 DOES NOT HAVE TO GET PAID. What if I have a high credit score, should I use an Indiana debt relief program? If your credit score is around 800 or higher right now, you are better off not even using a debt relief program. Try to find a way to pay more than minimum payments and get out of debt on your own. Having that high of a credit score is not easy to achieve. Click here to learn about each of these debt relief options more in detail. If credit card companies have sued you already and you lost 90% of your income, in this case, you may qualify for Chapter 7 bankruptcy. Indiana residents can use the Indiana State Bar Website to find a reputable attorney. Chapter 7 bankruptcy wipes away your bills, where the only fees you pay are the attorney fees (which can be around $2,000). If your income is above this median household income, you definitely won’t qualify for Chapter 7 bankruptcy. You would be required to file Chapter 13 bankruptcy. With Chapter 13, you will end up paying back at least half of your balances on each account. For that reason, Chapter 13 bankruptcy is rarely worth filing. The only case where Chapter 13 bankruptcy is worth filing, would be if you are on the urge of having your home foreclosed on. In some cases, Chapter 13 bankruptcy can save your home. The judge will reorganize your bills so that they are affordable to pay them off over around five years. Indiana residents are also required to take a consumer credit counseling class and obtain a bankruptcy certificate from this class, with a certified credit counseling company. This class is designed to educate you on debt relief programs, in hopes of keeping you out of bankruptcy. Bankruptcy will have the worst effect on a person’s credit, so you want to try to avoid filing for BK at all costs. Over $5,000 in debt is required to qualify for debt settlement, including medical bills, collection accounts, credit cards, car repossessions, and unsecured personal loans. Just about any type of unsecured bills will qualify. Debt validation plans require over $7,500 in unsecured bills and like with debt settlement almost any type of unsecured debt qualifies. Consumer credit counseling requires over $5,000 in credit cards only. Consolidation loans offer Indiana residents a way to transfer high-interest unsecured debts onto a low-interest loan. You would then have only one loan to pay back. However, to qualify for a low-interest loan, you must have a credit score of 700 or higher. Golden Financial Services does not offer loans, but we recommend you check with a credit union near you. Credit unions have a reputation of providing the lowest rate on consolidation loans. The downside with using a consolidation loan is that you will be required to pay off the entire balance on each account, plus interest and loan origination fees. Generally speaking, any non-profit consumer credit counseling company in Indiana that is A+ BBB Rated, is a safe company to work with. Consumer credit counseling programs won’t lower the amount you owe or even the monthly payment but will lower credit card interest rates. Instead of paying on 25% interest rates, you can get the rate reduced to 8-12% (average), allowing you to become debt free in sometimes half the time. Try this debt calculator tool to compare your payment on consumer credit counseling, versus all of the other credit card relief programs. Since creditors don’t get paid every month, credit scores can be negatively affected, and creditors can issue a summons on an account. Golden Financial Services sets clients up with an Indiana law firm, that is there to provide legal protection in case creditors do decide to pursue legal action. 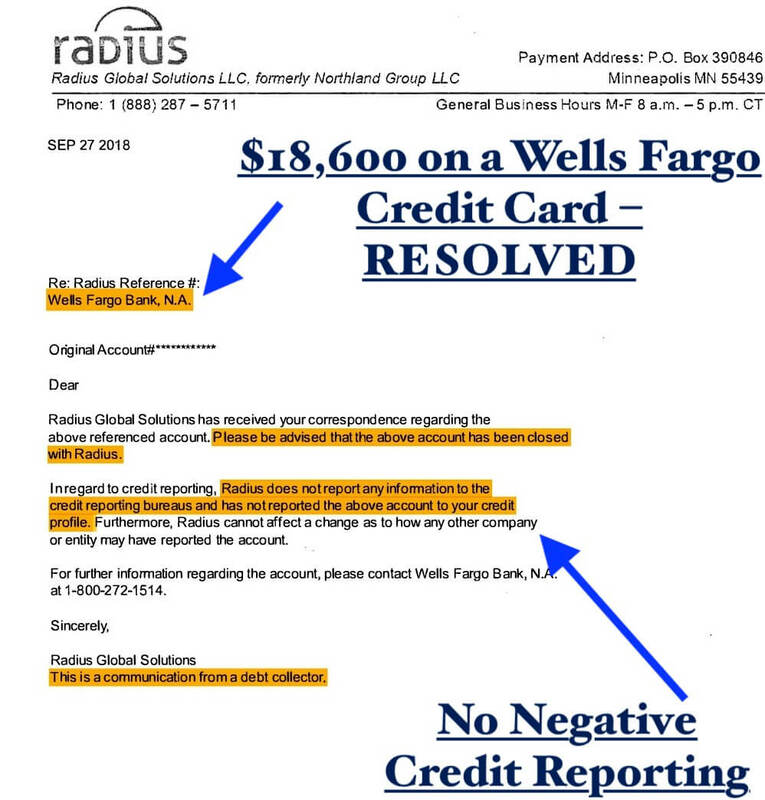 The worst action a creditor can take while enrolled on a debt negotiation program is to issue a summons to a client, but reputable settlement law firms and companies will immediately fight the summons and either get it dismissed or settle the account for less than the full balance owed. If a summons gets ignored, it could turn into a default judgment, having a more severe effect on credit, and could even result in garnishment if ignored long enough. Therefore, if you are that 2% of cases who do get served a credit card summons, the most critical action you can take is to send it over to your law firm immediately. When an account gets settled for less than the full amount owed, the savings can come across to the IRS as income. The solution: file a #982 IRS Form, illustrating to the IRS that you are insolvent, which could eliminate the tax liability. With fees included, clients will end up paying only around 68% of what they owe with settlement services. Each account gets settled for approximately 40-50% of the balance, and fees come out to approximate 17% of the total debt enrolled. Keep in mind, while on the settlement program interest rates and late fees will accumulate, causing balances to rise before getting settled. Once the settlement occurs, all late fees and interest get mitigated into the reduced payoff amount. For more information on debt relief, settlement and consolidation programs in Indiana, call (317) 981-7823. Do You Qualify For Indiana Debt Relief?